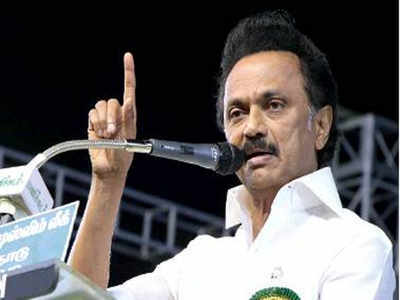 DMK president M K Stalin on Saturday said if the UPA was voted to power, the new government, in which the DMK would be part of, would waive all education loans in the country. Stalin was participating in a grama sabha meeting at Thorapalli village, native of former Tamil Nadu chief minister and the last Indian governor general C Rajagopalachari, in Krishnagiri district. “I have heard all your woes. Many have asked for waiver of education and farm loans. I can assure you that a government will be formed at the Centre after the Lok Sabha elections with the DMK’s support. It will waive all education loans,” said Stalin. The promise would find a mention in the DMK manifesto for the Lok Sabha elections, he said. The DMK leader criticised the state government for not holding elections for local bodies. “The state government is delaying local body elections out of fear that it will lose the elections. Now, time has come for the state government to face elections as it cannot delay the Lok Sabha elections,” said Stalin. He expressed hope that the Election Commission would hold simultaneous elections to the 21 vacant assembly segments. He said after the byelections, the AIADMK government would be reduced to minority and it would fall. Stalin said BJP president Amit Shah was suffering from poll fever as he was criticising the opposition parties instead of speaking about his government’s achievements. “At present, we don’t have a permanent Prime Minister as he is always travelling abroad,” said Stalin. Speaking at another function in Krishnagiri, where some Rajini Mandram members joined the DMK, Stalin reiterated that Congress president Rahul Gandhi was the Prime Ministerial candidate of the UPA. Next Looking for an education loan?